I’ve been struggling with this Robot 2 to try to get “arms” that I like. My desk is piled up with rejected parts. Time to do something else. 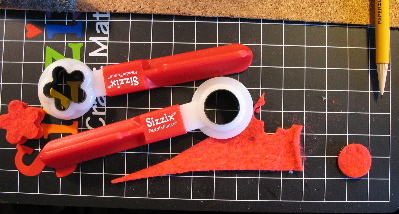 A while back I bought a sizzix’s cutter to try, not realizing I needed a kit to use it properly. I was a little reluctant to spend more then $20 on something that might not even work. I cut my risk by buying it on ebay for a lot less. Anyway, it turns out it is great! It cut the felt very cleanly. You can place the cutter anywhere on the fabric and then you hammer it to cut through and get the shapes. It is easy to cut 2 at a time. I haven’t tried more layers then that. I wonder how long the individual cutters will stay sharp. I have bought several of this type of punch, but the small, inexpensive ones don’t work at all. This one is pretty good. 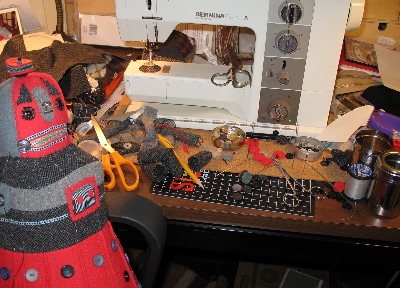 The problem with it is that you have to squeeze the felt into a slot to punch- this often causes a misshapen circle. Also, it limits the felt to the thinner pieces. It does not cut completely cleanly, but that is easy to fix by going over the circle with scissors. This paper punch is one of many that I use. 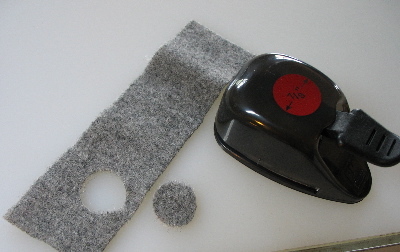 As you can see, it also doesn’t cut a nice clean circle out of the felt. I have to trim them out and I’m not very good at it when I am doing the smaller sizes (1/4″). I know the sizzix comes in a 1/4 inch circle so I will probably buy one of those. I like using repeating shapes to decorate the dolls. If you know of some other good shape and/or die cutters that work well, I’d love to hear about them. This entry was posted in favorite tools, General, progress report by mimik. Bookmark the permalink. Just wanted to let you know I can’t see your pictures for some reason–this post has pics, yes? Also your older archives don’t have pics anymore either–is it just me? Or is something broke? I couldn’t see your photos yesterday, but they’re here today. I’m glad I checked back…that robot #2 is great! I’m sure you’ll decide on some appropriate arms if you step back for a bit. Thanks for the punch info. I never thought of using these tools on fabric. I’m not familiar with the sissix cutters but I’ll check them out now. Thanks! Hi Mimi, just popping in to tell you how much I adore Miss Kitty and the Robots! (heh, heh, sounds like a sixties rock group!) Anyway, they are all very, very cute! I like when you talk about your tools– very helpful, thank you! Mimi, the Sizzix tool looks like it’s wonderful. After your first post about it, I looked at it at Michael’s Craft Store. Unfortunately they were out of the accompanying kit so I didn’t get it. Plus I kinda wanted to wait and see what luck you’d have with it. Now I know that it’s amazing. Thanks so much for sharing your results … and the Mrs. Robot is darling! Mimi… nice work… you’re very clever… because of this ideas. 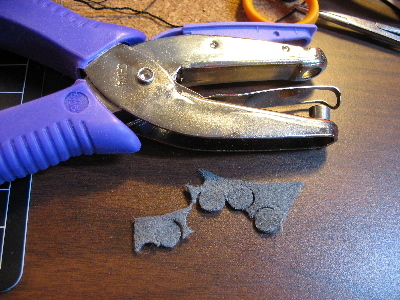 I always have this problem to cut “Perfect” circles of felt! but, thanks to you…I have no problem anymore! very cool. what kind of kit do you have to buy? i need to make nicer circles and shapes, and that looks like the ticket! Thank you! This was exactly the info I was looking for- I just bought a paddle punch on Ebay too! how big does it make the circles? I need one of these badly to cut felt! thanks so very much for your help. i just purchased a paddle punch on ebay too! hello! i also have the sizzixâ€™s cutter, but i dont understand exactly what else do i need to make it work! could you explain me more?